The National Education Association thinks Colin Kaepernick is an ideal role model. Many members, however, may take their loyalty elsewhere. And frankly, they should. If not necessarily as a pro-football player, then as an activist, Colin Kaepernick has come of age. 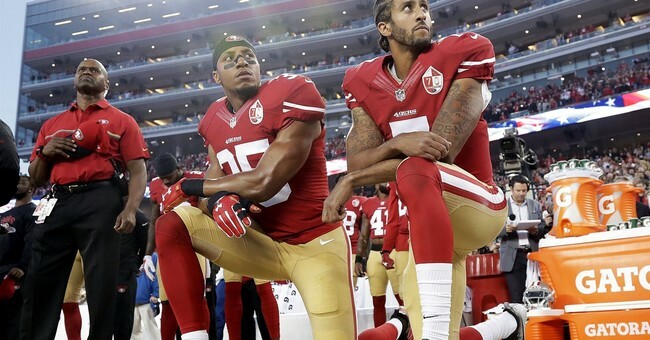 By initiating the now-common pregame kneel-down, fist-in-the-air ritual during the playing of the national anthem during the 2016 NFL season, the ex-San Francisco 49ers quarterback has retooled himself as a national conscience of sorts, reaping wholly undeserved public support. His allegations of systematic police brutality against blacks is a mélange of distortions. The denunciations of “police killings” about which he and fellow zealots doth protest represent a triumph of rhetoric over reality. Fatal incidents in Baltimore, Chicago, Minneapolis, New York City, Tulsa and other cities routinely cited by such activists, when scrutinized, have involved a suspect behaving erratically and even violently. Cops’ lives were in real jeopardy. Indeed, if the term “police killings” means anything, it refers to ambush-style multiple murders of police in Baton Rouge, Dallas, New York City and elsewhere. NFL officials from Commissioner Roger Goodell on down, fearful of bad publicity and possibly a strike, have preferred to accede to player-activists. Last November, the commissioner’s office and the team owners reached a settlement with protesting players in which the NFL would donate $89 million over seven years to various radical organizations. By any measure, this was a shakedown. The fact that it is not the job of the NFL or any other sports organization to bankroll political campaigns was irrelevant to the shakedown artists. Meanwhile, Colin Kaepernick’s star rose. In 2016, Kaepernick rationalized his refusal to stand at attention during the national anthem, “I am not going to stand up to show pride in a flag for a country that oppresses black people and people of color.” For such declarations of ostensible bravery, Sports Illustrated last fall presented him with its Muhammad Ali Legacy Award. Time magazine named him fifth runner-up for its 2017 “Person of the Year.” And this April, Amnesty International gave him its Ambassador of Conscience Award for his social activism and “refusal to ignore of accept racial discrimination.” For a while, Kaepernick’s 49ers “7” was the most popular NFL jersey, outselling even Tom Brady’s Patriots “12.” Though now an unemployable free agent, the radioactive quarterback is on top of his game – even if the game is no longer football. The human and civil rights champions we honor tonight are the epitome of the fierce urgency of now that Dr. Martin Luther King Jr. spoke about in his “I Have a Dream” speech. Through their deeds and actions, they have demonstrated remarkable courage and conviction to stand up for racial and social justice. They have shown an unrelenting resolve and ferocity to make a real difference for public education, students and our nation’s future. They are shining examples of social justice activism, fighting against injustices every day, and making sure that our great nation lives up to its promise. Such sanctimony underscores how far to the Left the NEA really is. But what if a sizable portion of the roughly three million teachers and other school employees represented by the union object to their dues payments being used this way? Until a few weeks ago, dissatisfied NEA members, along with fee-paying nonmembers, would have problems challenging union paycheck deductions. That changed on June 27, when the U.S. Supreme Court ruled 5-4 in Janus v. AFSCME Council 31 that the practice of forcing nonmember state and local public employees to pay partial dues (“agency fees”) to a union violates worker free speech. The decision overturned over 40 years of monopoly representation practiced in nearly two dozen states and curbed the future political clout of the National Education Association and other public-sector unions. According to internal estimates, the NEA alone may lose 200,000 members this year and another 100,000 next year. It should be mentioned here that the ranks of the National Education Association include dues-paying high school football coaches. This subset of membership, most of all, should consider exiting the union in absence of accountability from its leaders. Part of these coaches’ jobs involves instilling a sense of teamwork and respect for authority among their players, some of whom themselves may play in the NFL one day. Indeed, there is no justification for these coaches to continue furnishing funds to a union that honors Colin Kaepernick, someone whose public behavior runs counter to the lessons they impart to others. Carl F. Horowitz is senior fellow at National Legal and Policy Center, a Falls Church, Va.-based nonprofit group dedicated to ethics and accountability in American public life.